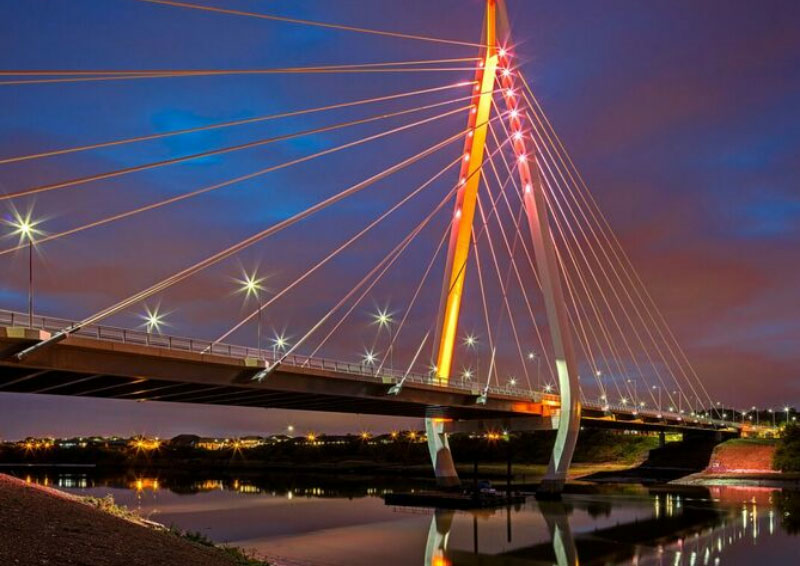 The Northern Spire opened in August 2018 and is the first new bridge to cross the River Wear in 40 years. It was constructed by Farrans Victor Buyck Joint Venture on behalf of Sunderland City Council at a cost of £117million. This landmark structure is part of the Sunderland Strategic Transport Corridor and features a 105m tall A-frame pylon from which a 336m long bridge deck is supported and connected into over 3km of new roads. Over 1 million accident free man hours were worked to complete the project and it will act as a catalyst for regeneration in the area, attracting jobs and investment. This presentation will discuss this award winning project, how it was successfully completed and the outstanding features of the construction process. Stephen is a Chartered Engineer, Fellow of the Institution of Civil Engineers and has over 20 years of experience in civil engineering contracting. Instrumental in forming the Farrans Victor Buyck joint venture team; Stephen lead the design and construction of Northern Spire. Stephen has extensive experience of and a strong understanding of civil engineering contracting having performed a wide variety of pre-contract and delivery roles in a contracting environment. Stephen’s current role is Civil Engineering Divisional Commercial Manager with Farrans Construction. Ryan graduated in 2009 and has worked on some of Farrans’ most challenging projects developing extensive experience in marine civil engineering and temporary works. Notable marine projects include D1 Belfast Harbour Offshore Wind Facility, the Seaforth Passage Widening Scheme and the P&O Terminal Ro-Ro Ramp Extension within the Port of Liverpool. On the Northern Spire he was responsible for overseeing the installation of the cofferdam housing the pylon foundations including a 1400m3 continuous 28 hour concrete pour and the temporary supports facilitating the bridge deck launches. He used innovative approaches to ensure high standards of health, safety and environmental sustainability when installing piles and demolishing the cofferdam and was responsible for multiple squads and training graduates. Ryan is currently working as a Bid Manager for Farrans Construction. Amy is a Chartered Engineer and Member of the Institution of Civil Engineers. She graduated in 2012 and has won a number of awards since then for her engineering skills, development work and commitment to promoting STEM subjects to students. Most recently she was named as one of The Telegraph and Women’s Engineering Society’s Top 50 Women in Engineering in 2017, was honoured as one of six women who have made an outstanding contribution to the Construction Industry by NCE Magazine and was a finalist in The Institution of Engineering and Technology Young Women Engineer of the Year Awards. On the Northern Spire Amy was responsible for managing the construction of sections of work including reinforced concrete structures, drainage, pavements, reinforced earth structures and piling. Amy is currently working in the Pre-Tender Department with Farrans Construction.